The waters and wilderness of the North West are in the forefront of 2016 as we ask for prompt action to formalize the tanker ban for our coast. What great news we had on Friday November 13th 2015 when Prime Minister Justin Trudeau called for a moratorium on crude oil tanker traffic through our North Coast! On the chilly morning of November 14th many Haida Gwaiians out and about at the mouth of the Hiellen River joined us at CoAST in affirming our desire to protect our waters. Thank you to all ! We have been signing post cards to thank our Prime Minister for the move – please get in touch with us to sign yours. The postcards are available at Green Gaia’s in Masset, Queen B’s and Isobel Creek in Charlotte. As the CBC reports, it is still unclear how the moratorium will impact the Northern Gateway Pipeline, and more so, (LNG) tanker traffic. We invite you to stay tuned with us at Haida Gwaii CoASt, and are grateful for your continued support. On Friday July 3rd, Haida Gwaii came together on Masset inlet to show their support for a Tanker-Free ocean, and rode the tide from Gaauu (Old Massett) to Masset harbour. Part of Pull Together’s “Week to End Enbridge,” the ‘Ride the Tide’ event shaped up in true Haida Gwaii style with Christian and Candace’s Haida Canoe alongside paddle boarders and kayakers from across the islands. There was a crush of people, naaniis (grandmothers), youth and spectators all along the shore following the action and cheering on the paddlers. A huge thank you/haw’aa to Christian White and Candace Weir for bringing the canoe out. As well to Guy Kimola for documenting the event so well, and Jim Hart and his crew for coming out to show their support. Haw’aa to Harmony and Old Massett Youth Centre for providing rides. A big haw’aa/thank you to all who came out to paddle and take show that Haida Gwaii stands unified in protection of our waters! Come Ride The Tide with us leaving from the beach access at the end of Old Massett. 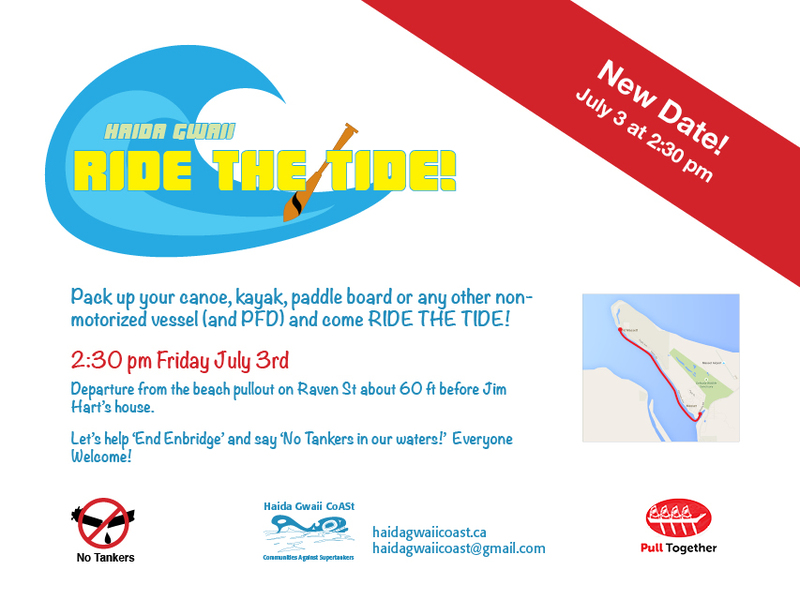 Ride in to the Harbour dock and help us get out the No Tankers message. Van transportation back to your cars provided by the Old Massett Youth Program. The event is part of the WEEK TO END ENBRIDGE. We’re getting together to celebrate our waters, our community, and to reaffirm that we say NO TANKERS! Bring your own non-motorized vessel, and a PFD. Everyone is welcome to participate, or come out with your NO TANKERS t-shirts and signs to show your support. Please read the latest letter from the CHN presenting the affirmation by Haida Hereditary Chiefs, Band Councils and citizens stating the continuing role of the Council of the Haida Nation in representing all Haidas, and their continuing opposition to the Enbridge Northern Gateway Project. Please read this open letter from the Council to the Haida Nation regarding the efforts companies like Enbridge are making to buy people off from First Nations communities in order to push their pipeline through. Haida Gwaii CoASt works to maintain the integrity of our coastal ecosystems, communities, and sustainable economies by opposing oil supertankers in the waters around Haida Gwaii.